In a non-stick saucepan heat oil over medium-high heat. Add garlic, onion and cook 5 minutes or until softened and starting to brown. Cut zucchinis in large chunks and add to pan. Sauté zucchinis for 5 minutes. 275 members have added this recipe to their cookbook. Soooooo tasty I loved it and plan on making it regularly! Pretty bland, but the base was a pretty color and had a desirable sort of fatty/creamy mouth feel with is hard to achieve in such a low calorie soup. With the addition of fresh lime juice, fresh cilantro, ground cumin and coriander it was quite good. i really enjoyed this soup but i added sauteed celery for more taste, onion stock cube instead of bouillon, rosemary, thyme, basil, and oregano. i also ended up, by accident, leaving out most of the onions when I blended it. I liked the texture much better with the sliced onions kept whole. I also have been making this for yrs. after having gotten the recipe from a WW leader & chef . You must use Knorr's beef bouillon cubes then no need for extra salt and the taste is unbelieveable . I have served this @ church luncheons . This soup is great!! I used "sodium free boullion" (I know sounds gross but it was great). Then, to add back the flavor it was lacking, served the bowl with just a dash of salt and a little fresh-grated parmesan on top. YUM! Even the boyfriend liked it. That with some turkey sandwiches was a great, filling dinner. AND I even have some left over for low-cal lunches. THANK YOU!!! I've been making this soup for years, but to it I add a can of diced tomaote, or a can of tomatoe sause, a handful of pasta and a small can of kidney beans. It's alot more hearty as I make it, and has a few more points, but you can make a meal of it. It's so-o-ooo delicious. I call mine Italian Minestrone Soup. Please rate this recipe - your feedback is appreciated! 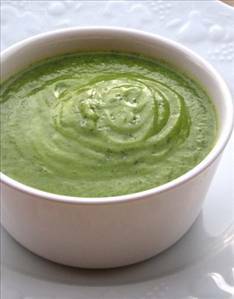 There are 51 calories in 1 serving of Zucchini Soup. Calorie break-down: 34% fat, 51% carbs, 15% protein.